What Do Young People Think of the Town? Every age group will have different requirements of the place where they live, and different priorities for improvements. The Society wanted to get the views of young people on what they think of the town, and we worked with Stamford School to conduct a street survey. We were very pleased with the enthusiastic response from the 58 students who took part, whose ages ranged from 12-18. We are always on the lookout for ways of improving the town – and often small things can create a big impact. Students used questionnaires to identify what works well and where there is potential to improve life for everyone in town. 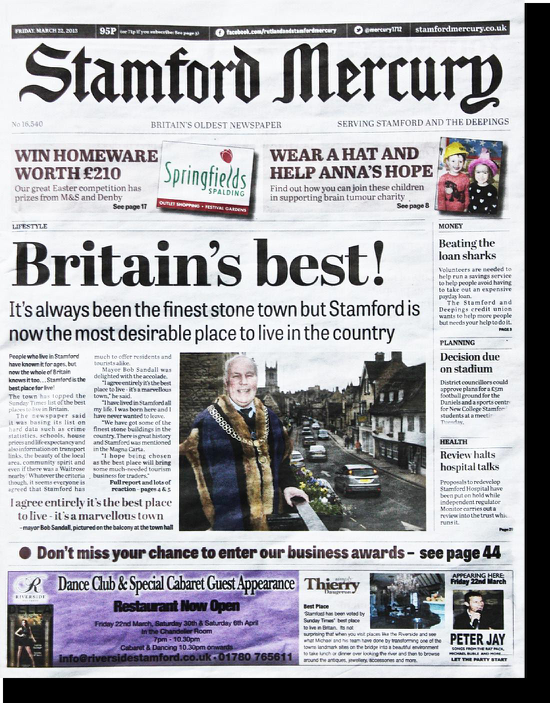 The feedback from the students was mainly very positive – they thought that Stamford was an attractive town – traditional and peaceful, “a warm and cosy town with new and old attractions”. Generally students thought that the town was a safe place, but there were some concerns about the state of the pavements and problems for cyclists. There was a very positive view of the visual attractions of the town, but students thought this could be improved by more green spaces with shrubs and trees and artistic pieces to make the town more vibrant and attractive. On the whole signage and information was thought to be reasonably adequate. There were comments about the lack of clear signs to the public toilets and need for more notice boards on the High Street. Students wanted to see digital hotspots (with free WiFi) where people could access information on their devices. They thought that QR (Quick Response) codes which enable people to pick up further specific information about the town and its facilities on their devices would be useful. Students thought that there should be more public toilets and better facilities for cyclists. Suggestions also included having more benches in quiet places. Although students noted that there were many litter bins ​they thought that more could be done to keep the streets cleaner and that there was a fair amount of dropped rubbish. There was a plea for more bins on the Meadows. Comments included the need for more recycling bins and wind turbines for clean energy. The problem of too many pigeons was noted. Provision for more facilities and specialist shops for teenagers, especially sports shops. More and better green spaces in which to relax. Cleaner streets, with less litter and graffiti and better paving. Better traffic management and car parking. Specific suggestions included more safe pedestrian crossings, and posts to stop drivers using the pedestrianised High Street, except for deliveries. More frequent and cheaper public transport, as well as more facilities for bikes eg. bike racks with security locks and cycle lanes. We were pleased to see the suggestions about the need for green spaces, and this connects with a current project to improve the setting of St Michael’s Churchyard. Previous page: Big, Bigger, Better?